I originally was using 4 pocket ultra pro binders for my sets. I had sorted them alphabetically by character. So page 1 was Angel, page 2 was Beast etc. This worked out well because characters either have 3 or 4 cards each (not counting OP cards). I thought maybe it'd be easier to have one giant binder, so I got some 9 card sheet. However, now the characters with 4 cards throws off the organization a bit. I like seeing all of the same character's cards on the same page. I'm just curious. How do you sort your cards? Do you put them in numerical order, alphabetical, or some other way? Anyone else run into this issue or am I just way too OCD? I don't use binders, because I don't like the constant move from sleeve to binder and back again. 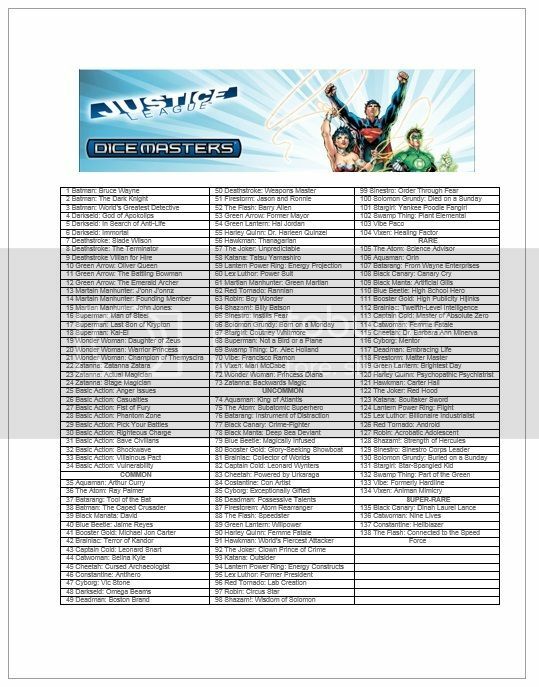 I have each card sorted by set in a deck box, so AVX has it's own, etc. The sets themselves are sorted alphabetically. I sort by set, then number and I keep them in my Plano box with dice from the same set. You have one empty space in the middle but you can easily see all of them. Harder to do with characters that have a lot of OP cards though. Last edited by pk2317; 04-23-2015 at 11:49 PM. I use the four pocket solution, with one per set. Each is just big enough to hold the whole set plus any OP cards. I keep thinking about different options but this one just makes way too much sense. I'm in transition on card storage, evaluating options. Right I have things stored double-sleeved in those long cardboard card boxes, with the major division being by set (AvX, UXM, YGO, etc). Each set has a different color sleeve so I never have to think twice about which set a card belongs to. Is this AvX Angel or UXM Angel? I acquired both of those sets at the same time, they're both Marvel, so they tend to blend together a bit for me. Basic Actions are stored separately, but everything else within a set is stored alphabetically by card name (the top line), then rarity. Collector numbers are ignored. This organization is super-convenient for pulling and replacing cards as you need them. You can also store a lot of cards in a small amount of space. It's not good for either "displaying" a collection or just sitting back and browsing/reading cards. That's where binders are nice. A think of beauty, ain't it? Full details on this and other card storage solutions to come in a few weeks. Holler if there are options you want me to include in the round-up. I'll be watching this thread for ideas. It sounds like I should add a 4 pocket binder to the list as they've already been mentioned twice. I use the nine-slot sleeves, and keep starter cards separate from the regular sets. Works for me. Still using standard deck boxes with sleeved cards, as a MTG player I had plenty of extras laying around. I buy the collector boxes and keep the cards with the dice, by set, and then in alphabetical order. The dice are in the same order as the cards, so the cards act as a sort of index for the dice. I have a screw box I got from Lowes to hold my spare Action/NPC dice and it has a spot big enough for a stack of cards I use for the action die headers and such. I do plan on putting my action cards in a binder for simplicity. That's great. Where did you get that? +1 - 12 pocket seems like the way to go. I redid my cards this way. I have the starters on 2 pages with the center spot open. Everyone else fits nicely in rows of 3. This will work out great til I can find a 4x3 binder. Thanks for the tip. OCD fulfilled. What is the fourth card for non starter characters in the 12 card binder? I could see going horizontal with starter characters, and then going vertical for non starter characters to maximize space. They are 38 bucks on Amazon. Search for 12 card binder and it's the first result. Might be available at other places too. He said it's for an extra rare/super rare for trading. Right, it is the DeckTudor FOUR v2 in the pictures, but that's not the 12 pocket one I'd recommend. For that you'll have to wait for my review. (PM me if you need to make a buy decision before then). I use a normal binder with card pages I bought off Amazon. I'm really wishing I had bought something that has side openings... Top openings are kind of a hassle. Is this article coming any time soon? I store my cards in a 9 pocket binder, I have the basic actions in one section and the cards are in order by purchase cost then rarity. It's not imminent. I'm waiting for a certain new product to release, so I can include it, but that doesn't happen until mid month. I use .5 inch to 1 inch binders with the 9 slot ultra-pro card sheets. I organize them by card number. For the cover I copied the artwork from the wizkids pages for the product and a check list underneath it that I created in a word doc. I use 9 card pages in a binder. I go straight alphabetical then by rarity. I just re-sorted my Marvel cards to accommodate the OP cards... making sure to leave spaces for the remaining three OP cards. I do the same. It's going to be tougher when more sets come out, but luckily both my girlfriend and I adore sorting out stuff.